A view of the Metropolitan Opera House at Lincoln Center for the Performing Arts. Lincoln Center for the Performing Arts is an extensive 16.3 acres (66,000 m²) arts complex in New York City which contains the city's finest performing arts venues, and serves as a home for New York's oldest and best established performing companies. At the head of the complex's central courtyard is the Metropolitan Opera House, flanked on the left by the New York State Theater, and on the right by Avery Fisher Hall. In addition to an impressive roster of resident performing companies, the center is also home to a specialized performing arts library, and top class dance and music training facilities. Created with a vision of bringing together the best of New York's resident performing companies into one major performing arts center, Lincoln Center was conceived and designed beginning in the 1950s. Ground was broken for the center in 1959, by President Dwight D. Eisenhower. The first theater, Philharmonic Hall (Avery Fisher Hall), is the main venue of the New York Philharmonic, opening in 1962. It was followed by the New York State Theater, resident theater to the New York City Opera and the New York City Ballet, in 1964. The Metropolitan Opera House, home to the Metropolitan Opera and site of the American Ballet Theater's annual Lincoln Center season, opened in 1966. In addition to the three main theaters, the center contains a number of other significant venues and arts institutions, and provides a standard by which performing arts is measured throughout the United States. The scope and quality of Lincoln Center's facilities, programs, and artistic companies is unequaled in any performing arts complex in the world. The performance arts can exert valuable, positive influences on people, contributing to their quality of life and well being. The center provides an environment that allows the arts to flourish and allows many people to experience quality performances. Lincoln Center makes a substantial contribution to the overall health of New York's residents and visitors. A sign directing visitors to the various buildings at Lincoln Center. Lincoln Center, an extensive complex of performing, rehearsal, and educational facilities is located in Manhattan's upper west side. The center contains a total of 22 performance facilities, which present thousands of performances every year, performed by resident companies, invited guest artists, and talented students from the center's educational institutions. 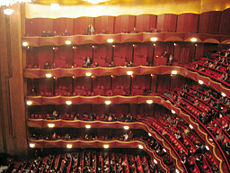 The center is operated by a consortium of twelve major arts organizations, each with its own administration and board of directors, listed here in alphabetical order: Chamber Music Society of Lincoln Center, Film Society of Lincoln Center, Jazz at Lincoln Center, Juilliard School, Lincoln Center for the Performing Arts, Inc., Lincoln Center Theater, Metropolitan Opera, New York City Ballet, New York City Opera, New York Philharmonic, New York Public Library for the Performing Arts, and School of American Ballet. Beginning with initial plans in the 1950s, with the first facilities completing construction in the early 1960s, Lincoln Center has continuously expanded and developed both its facilities and programs, bringing together arts and cultures from all across the globe, to present alongside the center's resident companies, totaling thousands of performances a year, created by thousands of artists. The center also contributes to the economic stability of the upper west side, with the center's resident companies, schools and organization providing jobs both in the arts and in a wide range of support fields, and drawing five million visitors a year to the neighborhood. A team of civic leaders and others led by, and under the initiative of John D. Rockefeller III, built Lincoln Center as part of the "Lincoln Square Renewal Project" during Robert Moses' program of urban renewal in the 1960s. Rockefeller was its inaugural president from 1956 and became its chairman in 1961. He is credited with raising more than half of the $184.5 million in private funds needed to build the complex, including drawing on his own funds; the Rockefeller Brothers Fund also contributed to the project. The Lincoln Center was the largest and most ambitious arts project in the history of New York City, and indeed in the United States. The center's plans included a new home for the Metropolitan Opera, the New York State Theater, to be shared by the New York City Opera and the New York City Ballet, the Avery Fisher Hall, which became the home of the New York Philharmonic, the Alice Tully Hall, and two theaters of drama. In order to create a resident nonprofit theater company to compliment the opera, ballet and orchestra, Repertory Theater of Lincoln Center was founded in 1960. With the facilities still in the final planning stages and under construction, a training program for a core of performers was initiated in 1962. The company's first production was Arthur Miller's After the Fall. The first two seasons presented repertory split between new American plays and American and European classics, but was met with cool critical reception, and the idea was abandoned for the time being. Reestablished in 1985, the theater company has flourished and now goes simply by the name of the Lincoln Center Theater, offering a combination of musicals and dramas. The Chamber Music Society of Lincoln Center was formed in 1965, and took residence in Alice Tully Hall. 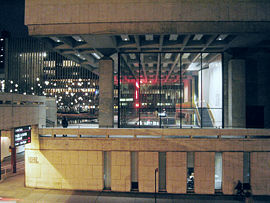 Throughout the 1960s, the major facilities of Lincoln center were completed, with the initial complex reaching completion with the opening of the Juilliard School in 1969. Fundraising campaigns for upkeep, expansion and renewal began immediately, and facilities have been added renovated continuously throughout the center's history. Lincoln Center cultural institutions also make use of facilities located away from the main campus. In 2004, Lincoln Center was expanded through the addition of Jazz at Lincoln Center's newly built facilities (Frederick P. Rose Hall) at the new Time Warner Center, located a few blocks to the south. In March 2006 Lincoln Center launched construction on a major redevelopment plan to modernize and renovate various parts of the Lincoln Center campus facilities in preparation for the center's 50th anniversary celebration in 2009. These include the 65th Street Project—part of a major redevelopment plan—to create a new pedestrian promenade designed to improve accessibility and the aesthetics of that area of the campus. Lincoln Center for the Performing Arts, Inc. is one of the 12 resident organization listed above, and serves three primary roles: Presenter of artistic programming, national leader in arts and education and community relations, and manager of the Lincoln Center campus. As a presenter of more than 400 events annually, its programs include American Songbook, Great Performers, Lincoln Center Festival, Lincoln Center Out of Doors, Midsummer Night Swing, the Mostly Mozart Festival, and the Emmy Award-winning Live From Lincoln Center. In July 2006, LCPA began work, in partnership with publishing company John Wiley & Sons, Inc. to publish at least 15 books, focusing on performing arts, and drawing on Lincoln Center Institute’s educational background and archives. The Metropolitan Opera House—3,900-seat opera house; home theater of the Metropolitan Opera, and used annually by American Ballet Theater for part of their New York season. This is the second Metropolitan Opera House; the original one opened in 1883 and was demolished in 1966, the year of the opening of the new Metropolitan Opera facilities at Lincoln Center. The architect was Wallace K. Harrison of Harrison & Abramovitz. The New York State Theater—2,713-seat theater opened April 23, 1964. The architect was Philip Johnson of Philip Johnson Associates. Originally constructed to be the home of the New York City Ballet, now also serves as home to the New York City Opera. Many Broadway musicals have also been revived there. Underwent acoustical renovations in 1982. Avery Fisher Hall—2,738-seat symphony hall; home venue of the New York Philharmonic; opened September 23, 1962 as Philharmonic Hall. The architect was Max Abramovitz of Harrison & Abramovitz. Renamed Avery Fisher Hall in 1973 to commemorate a generous donation from Avery Fisher. Underwent acoustical improvements in 1976. Alice Tully Hall—1,095-seat concert hall located within the Juilliard School building, opened September 11, 1969; home venue for The Chamber Music Society of Lincoln Center. The primary architect was Pietro Belluschi. The associate architects are Helge Westermann and Eduardo Catalano. In 1987, Alice Tully Hall also became host to the Classical Jazz series. Expansion and other renovations to the hall were carried out between 2007 and 2008. Vivian Beaumont Theater—1,080-seat Broadway-style theater opened October 14, 1965. The architect was Eero Saarinen of Eero Saarinen & Associates. 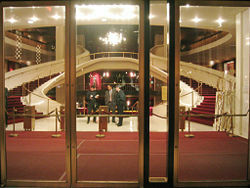 Operated since 1985 as the main stage of Lincoln Center Theater. Previously occupied by The Repertory Theater of Lincoln Center (1965-1973) and The New York Shakespeare Festival (1973-1977). Mitzi E. Newhouse Theater (originally known as the Forum when it opened October 14, 1965)—intimate 299-seat theater operated by Lincoln Center Theater for its Off-Broadway-style productions. Renamed the Mitzi E. Newhouse Theater in 1973. The Walter Reade Theatre—268-seat movie theater, opened December 3, 1991; used by the Film Society of Lincoln Center; features a raised dais used for post-screening filmmaker discussions. Since 1996, also home to Reel to Real for Kids, a program combining movie excerpts with live music. Rose Theater—1,094-seat concert hall designed for jazz performances. American Ballet Theatre, while not a resident company at Lincoln Center, presents annual seasons in Lincoln Center's Metropolitan Opera House. The company was founded in 1937, and performs an extensive repertory of classical ballet works from top choreographers from all around the world. The Chamber Music Society of Lincoln Center was formed in 1965, as Lincoln Center was being constructed, and presented its first concert in 1969. Resident in Alice Tully hall, the society has a roster of 35 full time musicians, and performs a variety of chamber repertory, dating as far back as the Renaissance. CMS has also commissioned more than 135 new works from contemporary composers, including Bruce Adolphe, Samuel Barber, Leonard Bernstein, William Bolcom, John Corigliano, George Crumb, Lukas Foss, John Harbison, Alberto Ginastera, Morton Gould, Keith Jarrett, Oliver Knussen, Gian Carlo Menotti, Darius Milhaud, Peter Schickele, Bright Sheng, Joan Tower, and Ellen Taaffe Zwilich. Film Society of Lincoln Center (sponsor of the New York Film Festival) was founded in 1969. Resident in the Walter Reade Theater, the Film Society focuses on spotlighting American independent and new filmmakers. The society has also introduced a number of acclaimed foreign filmmakers to the U.S. movie public, produces an annual Gala Tribute recognizing U.S. film personalities of exceptional accomplishment, and publishes a bi-monthly journal, Film Comment. Jazz at Lincoln Center became a constituent member of Lincoln Center in 1996. Eight years later, they now have their own dedicated facility at Columbus Circle, with three performance venues, The Allen Room, Dizzy's Club Coca-Cola, and the Rose Theater. Jazz at Lincoln Center produces over 3000 events a year, including performances, children's concerts, adult education and broadcast events, as well as providing a variety of musical training programs in jazz. The Juilliard School is a professional performing arts conservatory, with about 800 undergraduate and undergraduate students in music, dance and drama. 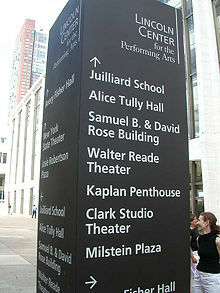 The Juilliard School was founded in 1905, and moved to its current Lincoln Center campus in 1969. The school provides a large number of performance opportunities to students with a number of school performance ensembles. Lincoln Center for the Performing Arts, Inc., in addition to providing overall coordination and oversight for the entire Lincoln Center complex, presents more than 400 performances a year through the Lincoln Center Presents program. Lincoln Center Presents invites artists from around the world, including well established artists and newcomers, presenting performances in the center's major and minor venues, as well as in the courtyards and on temporary stages during the summer months. 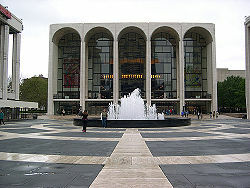 Lincoln Center Theater, since its establishment in 1985, has presented musicals and dramas in the Vivian Beaumont Theater, the Mitzi E. Newhouse Theater, and other venues. The Metropolitan Opera, founded in 1880, and resident in Lincoln Center's Metropolitan Opera House since 1966, presents about 240 opera performances each year, consisting of about 30 different productions annually. The company's roster of artists includes a large orchestra, chorus, dancers, children's chorus and an international roster of solo singers. The Met is known for the quality of its productions, both musical and in production elements. New York City Ballet, with a large roster of more than 90 dancers, and a active repertory of more than 150 works, was founded in 1946 with choreographer George Balanchine as ballet master in chief. Balanchine created most of his impressive opus of works for the New York City Ballet, where he remained until his death in 1983. Jerome Robbins and Peter Martins have also choreographed numerous works for the company. Balanchine was involved in the design of the New York State Theater, which has been the company's home since it opened in 1964. New York City Ballet has also had a permanent summer home at The Saratoga Performing Arts Center since 1966. New York City Opera, resident in the New York State Theater, was founded in 1944 with a goal of making opera accessible to as wide a public as possible. NYCO continues to pursue this goal with performances throughout the five boroughs, and was the first U.S. opera company to employ supertitles to assist audiences in following the libretto and story as they watch productions. The company features American singers and composers. New York Philharmonic, founded in 1842, is the oldest orchestra in the United States. The orchestra has taken the lead in presenting new compositions by composers such as Dvorak, Rachmaninoff, Gershwin, and many others. In addition to live concerts, the orchestra has also made more than 2000 recordings since 1917. The New York Philharmonic roster of more than 100 fine musicians play its season of more than 150 concerts in Avery Fisher Hall each year. New York Public Library for the Performing Arts, located at Lincoln Center, is part of the New York City library system, and features an extensive audio and video collection of musical and theatrical performances. School of American Ballet is the official school of the New York City Ballet, and is located at Lincoln Center. Each organization has its own board of directors and administration. Together, they present thousands of performances, educational programs, tours, and other events every year. In popular culture, in the 1990s PBS game show Where in the World Is Carmen Sandiego? Robocrook steals Lincoln Center. The Center also appears in the movies The Producers (1968 film), August Rush, Moonstruck, and Ghostbusters. The center has been seen many times on the Young People's Concerts, and is regularly featured on PBS's Live from Lincoln Center. 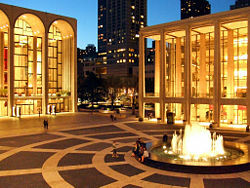 The Lincoln Center for the Performing Arts remains one of the world's leading presenters of performing arts. Its performances range from authentic kabuki theater and dance premieres from world-renowned choreographers, to outdoor dancing to live music, to opera performed with life-size puppets and free performances of Korean drumming and African dance. In the 2007 season alone, there were roughly 5000 performances by over 3000 artists, from every corner of the globe. The Lincoln Center has won Emmy Awards for its Live From Lincoln Center telecasts. It remains a leader in arts and education, as well as community relations, and takes a maintains a wide range of activities beyond its concert halls and through its education arm. The Lincoln Center Institute offers arts-related symposiums, family programming, and other community initiatives. It also is responsible for providing curricula to educational institutions in in Australia, China, Mexico, and South Africa. The Lincoln Center strives to make art from around the world accessible to everyone. ↑ 1.0 1.1 Answers.com, Lincoln Center. Retrieved September 15, 2008. ↑ Robin Pogrebin, Glimpsing The Future On 65th St, New York Times, August 17, 2006. Retrieved September 15, 2008. ↑ 3.0 3.1 3.2 Lincoln Center, About Lincoln Center. Retrieved September 15, 2008. Holzer, Madeleine Fuchs, and Scott Noppe-Brandon. Community in the Making: Lincoln Center Institute, the Arts, and Teacher Education. New York: Teachers College Press, 2005. ISBN 9780807745908. Stamas, Stephen, and Sharon Zane. Lincoln Center: A Promise Realized. Hoboken, N.J.: Wiley, 2007. ISBN 9780470101230. Young, Edgar B. Lincoln Center: The Building of an Institution. New York: New York University Press, 1980. ISBN 9780814796566. History of "Lincoln Center for the Performing Arts"
This page was last modified on 23 July 2018, at 15:27.